There are several myths widespread in the horse community – even among some “old school” equine vets, unfortunately – about blind horses that require separate responses. Myth No. 1 — A blind horse can’t have a good quality of life. Myth No. 2 — A blind horse is dangerous. Myth No. 3 — A blind horse takes a lot more work to care for than a sighted horse. Other than providing a safe environment – and many of the things you’d do for a blind horse would benefit a sighted horse – there is really no more work required to care for a blind horse. Feeding, watering, grooming, trimming … horse care is horse care. The only thing you have to do differently for a blind horse is keep it out of a herd and away from horses that will bully it. And there are some advantages to blind horses … they don’t pick gate latches and take off down the road! Myth No. 4 — You can’t put a blind horse on pasture. Yes, you can. You do need to have safe fencing and inspect your pastures, and you’ll need to make sure there are no other animals present who will bully it. But otherwise there’s no reason your blind horse can’t enjoy being on pasture. You should give it a friend of some sort – an easy-going, gentle pasture buddy – so it isn’t alone. Myth No. 5 — Blind horses aren’t good for anything. Tip No. 1 — Get the best veterinary care possible. Tip No. 2 — Give it time to adjust to blindness. Going blind can be a frightening experience, especially if the loss of vision occurs suddenly. Bring your horse into a corral or stall where it can be safely confined while it adjusts to the encroaching darkness. Your horse may exhibit fearful, panicky or erratic behavior during this time, but this is a natural response to the process of losing sight. Do not assume that your horse will always be like this, because it won’t. It may take days or weeks to adjust to blindness, but your horse is likely to adapt just fine. Yes, there are some high-strung horses that may not adjust to blindness, but these are rare. Most horses adjust very well to blindness and, if given a chance, can enjoy a wonderful quality of life. Tip No. 3 — Keep it out of the herd. Blind horses can’t read the visual social cues of other horses. This “failure to communicate” can lead to unfortunate results for a blind horse in a herd environment. The blind horse ends up at the bottom of the pecking order, getting bullied and beaten up by others. Even if a blind horse is not getting bullied, it will try to keep up with the herd … and that can put it at risk, too. Although there are exceptions, in general a herd is a bad place to be for a blind horse. Horses need company, of course, so give your blind horse a compatible pasture buddy for a friend. Woven-wire mesh fencing and smooth-wire fencing are good choices for blind horse pastures, as are traditional wood and pipe fencing. Barbed wire should never be used, nor should electric fencing. 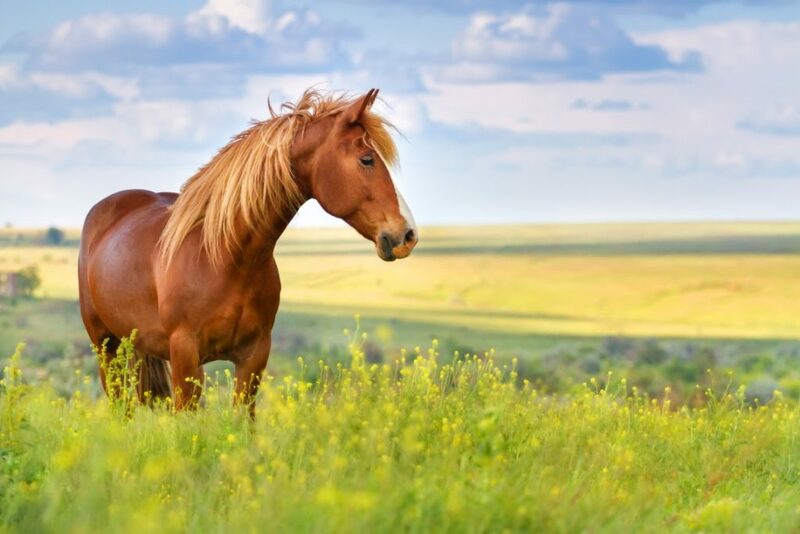 If a blind horse is shocked by an electric fence, it may panic, whirl around … and go right back into the electric fence. Because they can’t see what shocked them, it can be scary. For corrals and runs, we recommend lightweight metal corral panels chained to T-posts (placed on the outside). These bend and flex if a blind horse walks into them. You may have to replace a bent panel, but you won’t have to take your horse to the vet. Tip No. 5 — Inspect pastures. Pastures should be free of holes, low-hanging tree limbs, debris, jagged fencing and anything else potentially dangerous to a blind horse. You’ll need to conduct “hole patrols” periodically to make sure gophers and other wildlife haven’t dug new holes. If you have trees or telephone poles in your pasture, you can signal their presence by spreading gravel or rock at the base, or ringing them with sand-filled tires. You can also use inexpensive corral panels to fence off trees and poles in your pasture.